Walking with Jesus: Day 26: Acts 9:1-9 & Prov. 11:21-31 - How Does Jesus Feel About the Church? Day 26: Acts 9:1-9 & Prov. 11:21-31 - How Does Jesus Feel About the Church? 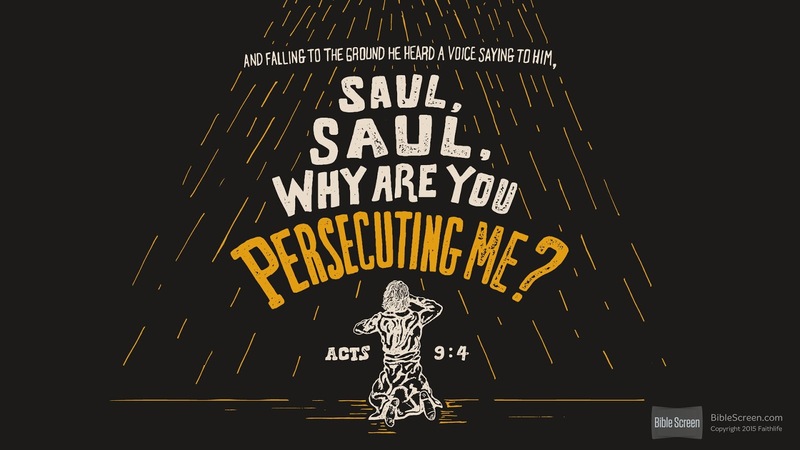 And falling to the ground, he heard a voice saying to him, “Saul, Saul, why are you persecuting me?” And he said, “Who are you, Lord?” And he said, “I am Jesus, whom you are persecuting." How Does Jesus Feel About the Church? The church is not perfect. I know you're hardly shocked to hear that. Scandals, hypocrisy, a lack of love, arrogance, wishy-washiness, legalistic human standards, a total lack of standards, overly intellectual academic preaching, dumbed-down intellectually vapid preaching, churches totally out-of-touch with the world, churches totally in love with the world and given over to worldliness, poor leadership, congregants that engage in gossip and back-biting and more have all plagued and characterized the church at different times. So, what does Jesus think of the church? Well, the letters to the seven churches in Asia Minor found in Revelation 2-3 show clearly that Jesus is aware of the church's flaws. Letters like Galatians and 1 & 2 Corinthians also address the legalism, factions, hypocrisy, scandalous sin and lack of love that have troubled the church since the earliest days. These letters are helpful, but if we're not careful we can become totally cynical. We can think that the church is nothing but problems, nothing but a mess. Today's passage describing the conversion of Saul the Persecutor to Paul the Apostle has at its heart a very important reminder of how Jesus feels about His church. 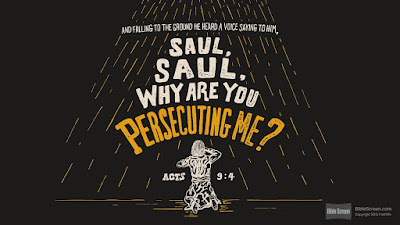 When Jesus knocks Saul off his high horse and blinds him with the glory of His presence, He asks Saul a question: "Why are you persecuting Me?" Now, Saul had been going around harassing the church and arresting Christians. He had not taken any personal role in the actual trial and crucifixion of Jesus Himself, which has taken place several years earlier. But to Jesus, persecuting His church was persecuting Him. He so completely identifies with His body, the church, that for Saul to arrest and imprison Christians was for him to arrest and imprison Jesus. This is not the only place in Scripture where we see this level of identification. In Matthew 25:31-46, when Jesus judges the sheep and the goats, He identifies Himself with the suffering of His people. Then, in Ephesians 5:23-32, when Paul teaches on marriage, he says that Christ nourishes and cherishes the church as His own body. The church is a mess at times, but it remains the bride of Christ and His body. He laid down His life for her, and He cares for her with deep affection and sacrificial dedication. In today's passage, we see His love for the church in removing her chief persecutor and appointing him to be her boldest missionary. May the Lord give us such a love for His church! Heavenly Father, we confess that we can often get overwhelmed, discouraged and cynical about Your church. Give us a heart to love Your church, even as You love her. Give us the willingness and even the eagerness to serve our brothers and sisters with sacrificial love and forgiveness, even as Christ has served us. In Jesus' name we pray, Amen. and that we will be delivered through Him! but give us the wisdom to always have discretion. and for the promised good we have in Him. to meet the needs of those You bring into our lives. watering the seed of Your word sown in people's lives. turning away from evil and desiring Your will above our sin. but let us seek to use these passing things for eternal purposes. and give us wise hearts in our family relationships. Father, give us good fruit as we seek to win souls to You! Lord, how sobering Your word can be.